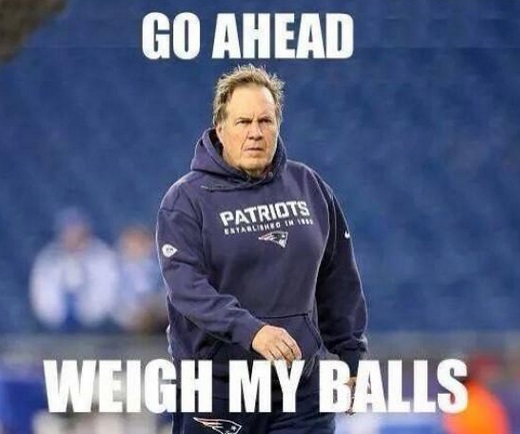 Deflate-gate and the presentation of the winning game ball! Following the success of Spending Quality Time With Known Felons in a Dimly Lit Bar (less death threats than usual) here is another guess post from Another Idiot. Enjoy. For as long as I can remember, it has been customary in the NFL to present the game ball to the team member that was most responsible for the win. 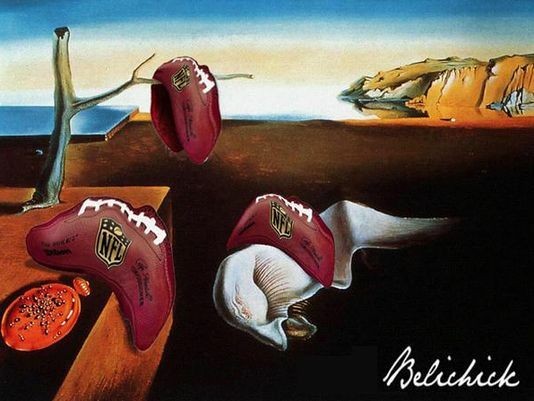 Football is an American tradition, the most popular sport, and one of my favorite pass-times. Every year football fans yearn for midsummer after waiting several months during the off season in anticipation of a winning season for their favorite team, and a possible playoff berth. For most of us we end up disappointed in our favorite team’s inability to continue to the end of the season, and win a Super Bowl. It seems to reason that teams will have ups and downs, good years and bad, streaks of fortune and misfortune. However, some teams seem to always be in the hunt, and never have an off-season no matter what their personnel situation is. They are always in the playoffs, and always have a shot at a Lombardi trophy. If you haven’t guessed it by now; I’m talking about the New England Patriots. Heavy thinking, (well, probably not). And many other ill effects that could alter your personality, and life styles too numerous to list. 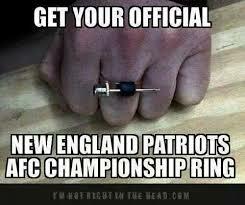 So if you are a New England Patriot’s fan, you have been warned. It’s still not too late to turn back. As we cheer for our teams, we take pride in their accomplishments. There is a certain amount of ethics and morals that go into the standards in which the game is played. We don’t tolerate cheating, and a certain amount of disdain is fostered towards those athletes who decide that winning took precedence over ethics of the game. I’m talking about the New England Patriot’s deflate-gate and spy gate. The patriots have been caught red handed, cheating; and twice, (in my humble opinion), they have gotten off easy. The first incident was the “Spy Gate” of 2007 where the Patriots were videotaping other teams signal calling during the game. Coach Belichick was fined $500,000 the maximum, the team fined $250,000, and the loss of their first draft choice. It was discovered that the team had used this practice since 2000. The second was Tom Brady being suspended for four games for violating the rule of 12.5 to 13.5 PSI air pressure in the game balls in 2014. What do both these incidents have in common? Both years the Patriots were playing in a Super Bowl, and both years they were caught cheating. -Mike Tomlin, Pittsburgh’s head coach, stepped on field to disrupt play, fined $100,000. He apologized and put it behind him. -Ray Farmer, Cleveland’s GM fined $250,000 and suspended four games for texting his coach during a game. -New Orleans Saints bounty gate, Head coach suspended one year, defensive coordinator suspended indefinitely, GM suspended eight games, assistant head coach suspended six games, Vilma suspended 2012 season, Anthony Hargrove suspended eight games, Will Smith suspended four games, and Scott Fujita three game suspension, $500,000 fine and loss of 2nd round draft picks in 2012 and 2013 seasons, (their first round pick was traded away to NE). -Falcons fined $350,000 for pumping noise into the stadium, and lost 5th round draft in 2016. -Penn State: too much to list, (they never cheated; they had a sick individual on their college coaching staff who caused the entire system to suffer for years). You know the story. (Four games isn’t enough) for 1 year during the 2016 football season. Real list: Fire the equipment managers. them unconditional access to the equipment room. Real list: Forfeit playoff availability for one year. idiotprufs’ list: NFL forfeit the New England Patriots for one year. Real list: Robert Kraft forced to sell team. are really good cookies, especially PB). In light of “SPY GATE”, the length of time the Patriots’ conducted it and got away with it; it is perplexing to me that they aren’t suspected of continuing the practice to this day. After seeing them come from behind on numerous occasions after half-time, it is fishy that they miraculously seem to know what the other team is going to do, and their opponents seem to have no answer to this conundrum. The Buffalo Bills beat the Patriots in 2011, 34-31 after leading at the half 21-0. The Bills QB claimed that they changed their signal calling after the half to confuse New England; it worked. The Patriots looked confused, as if they expected the plays to be totally different. I’m surprised other teams haven’t adopted this practice. 1) Over-inflate the game balls. 2) Learn New England’s signal calls and change strategy at the half. 3) Change their signals after the half to the opposite of what they were in the first half. 4) Pay the refs more than New England. 5) Sell the Patriots Ex-lax laced Girl Scout cookies; (this is extremely cruel, as no one should mess with Girl Scout cookies, especially the peanut butter). 6) Pay a bounty to the defense. 7) Pump noise into the stadium. 8) Text your coach during the game. (I’m not sure how this would work, but it must somehow; it’s illegal. Anyway, millions of teenagers couldn’t be wrong). 9) Pretend the refs are mimes and ignore them. Their outfits are sort of similar. 10) Step near the field of play and jump back at the last second; it works every time. So in closing, I think the game ball from the New England Super Bowl win should be presented to the equipment manager’s Jim McNally and John Jastranski. The Colts probably wouldn’t have won that game, it was too one sided. However, the Ravens lost 35-31 in the January weather in New England; deflated balls and knowing the other team’s plays after the half may have been enough to turn the tide of the game in New England’s favor. YOU are suggesting…no… encouraging MIMES. Okay I’m seeing deep psychological scaring. Deep. By the way…I’m no fan of football but if you dress them up in scout outfits and bring them to my door with cookies, I WILL be. Thank you. This entire blog is the product of deep psychological scarring.